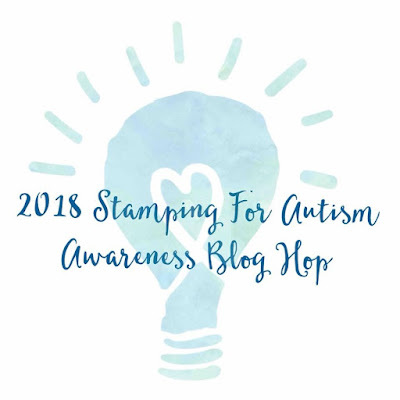 I'm so happy to be joining with the Stamping For Autism Awareness Blog Hop! How cool is it that we can support awareness with our crafts?! And what a wonderful community we have! 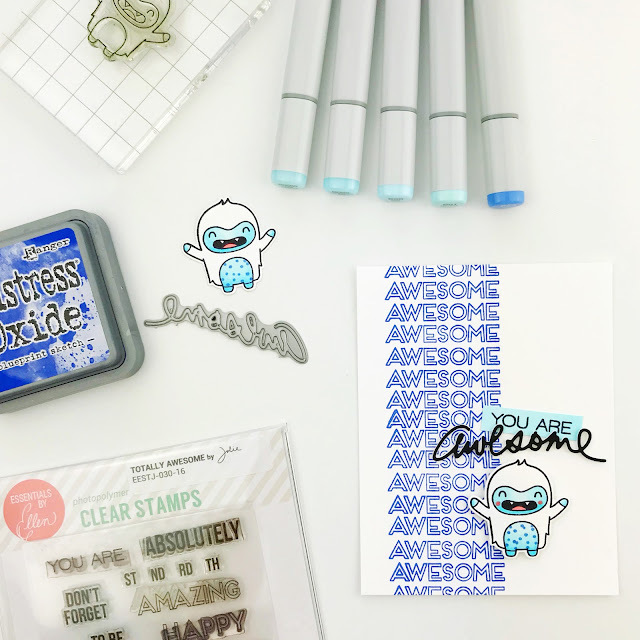 To create my card, I used my MISTI to stamp "awesome" down the front in Distress Oxide Blueprint Sketch. I colored many little Lawn Fawn Yetis before I settled on this one, foam mounting him on the card front. For the sentiment, I used my Copic B000 to color a scratch strip of cardstock. Then I stamped the "you are". And to complete the sentiment, I layered one black "awesome" word die cut over 4 white ones. Does anyone else do this? When I choose a image, I stamp it bunches of times so I can have "practice shots" for the coloring. And I still need lots of practice with my coloring, LOL! And don't forget to check out our awesome sponsors! Thanks so much for stopping by and have fun hopping! I love this , Carly! I like that you used the Yeti for your card. How fun. Awesome card! Thanks for sharing! This is DARLING! And just right for this hop!! Delightful and fun! Perfect for such a worthy cause! Sooooo LOVE this card, dearie!!! Thanks for being a apart of this AWESOME event!!! What a worthy cause for this blog hop! Your card is AWESOME! This card made me smile. 😊 I like the repeat word stamping and the critter. This card just screams my son! Its absolutely PERFECT!! Thank you for also taking part in such a wonderful blog hop for such a worthy cause!! such a cute card, it says it all. thank you. Great card and I love the design and dimension of it with the little yeti. So cute. This card is adorable. Love that yeti!! What a fun creation! So cute :) Thanks to everyone who are part of the awesome blog hop, and to the sponsors! Your Yeti is just screaming out a positive message. Clever card! Love that Yeti. Great card thank you for sharing and taking part. Unique card for such a worthwhile cause. Such a Very Cute Card!! Love it!! Thanks for sharing!! I love Yeti stamps. 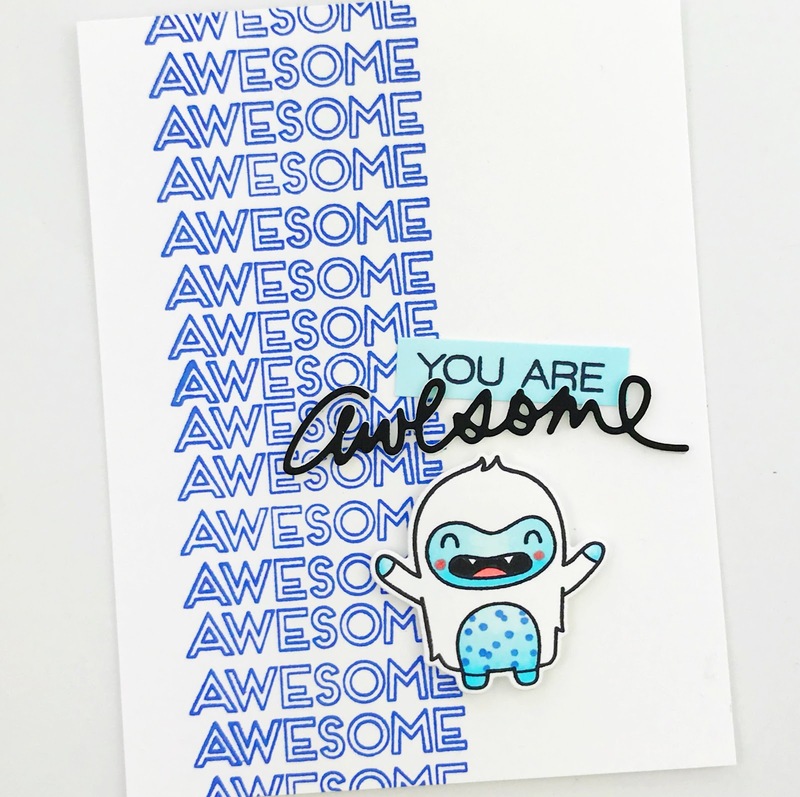 Cute card and wonderful way to tell someone that they are awesome. You are pretty awesome for stamping for Autism awareness. Great card for a worthy cause. Cute card that made me smile! Thank for for sharing your talents to help this great cause! Your Yeti is so cute and yes I always stamp multiples, can always use the practice, thanks! Cute card. We all need to be told that we are awesome. Thanks for participating in this event. Such a great card! Fun! I love this initiative! After homeschooling my 5 children for 27 yrs, I took a job as an EA/TA to a 7yr old boy who was on the autism spectrum. He also had FASD. I was with him for 3 years and LOVED it all! Thank you for bringing forward more awareness of the awesomeness of these children. Your card is adorable ! I'm like you, I need to practice my techniques. So I usually stamp many times my pictures and if I finally find more than needed which are good enough to be used on a card, I keep them for a future project. But my future project box is very small and still quite empty..... I've got to practice, practice and practice some more, and I love it - LOL ! Thank you for this fantastic blog hop ! Such an "Awesome" card! 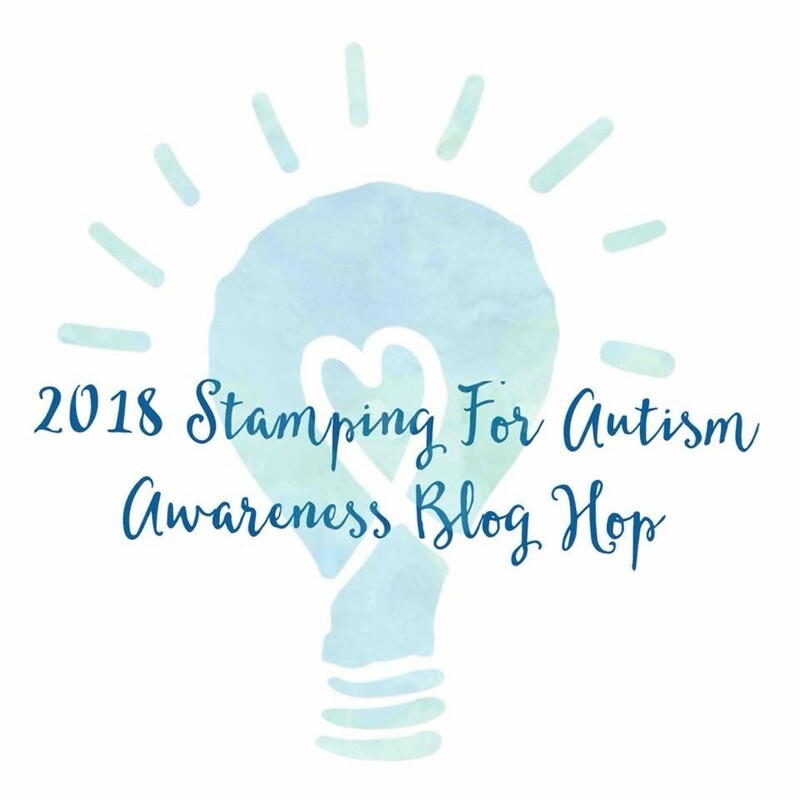 Thank you so very much for participating in this blog hop for Autism. And yes, I too stamp (many) multiple images, regardless of my "coloring" method. Phew, I thought I was the only one doing that (and possibly wasting paper). Amazing card for a kid, the yeti is adorable. Fun card! Love the yeti and his all important message. Thanks for helping raise awareness of the autism spectrum! Adorable! I love that technique and your card is just precious!! Thanks for the inspiration! Oh what fun monsters! Thanks for supporting the Autism Awareness Day & Blog Hop. Super cute card! I love his spotted belly. So super cute I just love this!!!! Your coloring is beautiful I love the bright blue <3 thank you so much for sharing! what a fun card! Love the yeti! Very cute and fun card. thanks for sharing it with us. Your card is just as cute as it is fun !! Love this yeti ! How fun! Love the repeated stamped word and the script of the awesome die. Your card is so adorable! Love it!! Thank you for being part of this amazing hop. I love the yeti! Great card. Such a cute card and awesome sentiment! Love how you colored your yeti! So cute and great use of blue! What a colorful card! The recipient will love receiving this eye-catching card with a powerful, affirming message! Such a cute card. Love to try this one. What an AWESOME card!!!! LOL The yetti is so cute! Another mama with a beautiful 30yo son with Autism and a 28yo daughter that teaches Special Ed with a true passion! So very proud of them both, and grateful to you getting this blog hop going! Sporting my blue today, and have my front porch blue bulbs glowing! Thanks for the perfect card! Thanks for participating for this great cause. Your card is absolutely adorable. I love the Awesome all the way down the front and who doesn't love a little Yeti. Super fun card, thanks for helping raise autism awareness! What a great card for a young person or young at heart! Fantastic card! I'm still smiling, what an adorable monster. I love the combo of the 2 different awesome words! Great card!!!! Really looks fantastic!!! She is beautiful, just like your card! Really fun card ... what a great way to use the yeti!! Such a cute card, I love it excellent job thank you so much for sharing! Such a cute card! Love the background with the repeating sentiment. And I love the polka dot belly! What a cute card!!!!! I love the yeti. Adorable. How fabulous! I think I have this stamp set too. Thank you so much for participating in this worthy cause! Great card to say so much! Glad you are helping to support a great cause! Awareness is the best start! What and AWESOME card. Thanks for sharing. Very cute card. Thanks for participating. What a great card with the repeated sentiment...love that yeti. So clever and eye catching with the repeated sentiment - I keep forgetting to try this look! Thanks for supporting this great cause! So cute - love the little Yeti. Super duper cute!!! Love the awesome sentiment background!! Nice card! I wouldn't have thought to use Distress oxide ink for stamping...looks great! Thank you for being a part of this blog hot! I love your cute card! It’s truly awesome! Thanks or sharing your precious card and helping to share autism awareness throughout the paper crafting community.. Cute and awesome card design. Aww...such a cute card... Love it..
Great cause and great card. 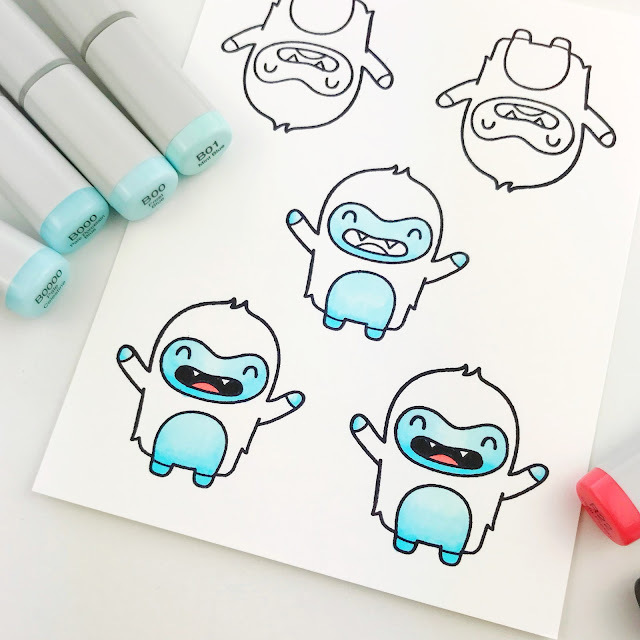 That little yeti is so adorable and awesome! The yeti is just adorable! What a great card! I love the word strip down the card. Thanks for the inspiration. Now I want to send my grandson a card to tell him how awesome he is! How fun!!! Love your sweet card!!! I love your card, is stunning!!! This is such a cute card! The yeti is so adorable! I love the overall card design! This is totally cute!! 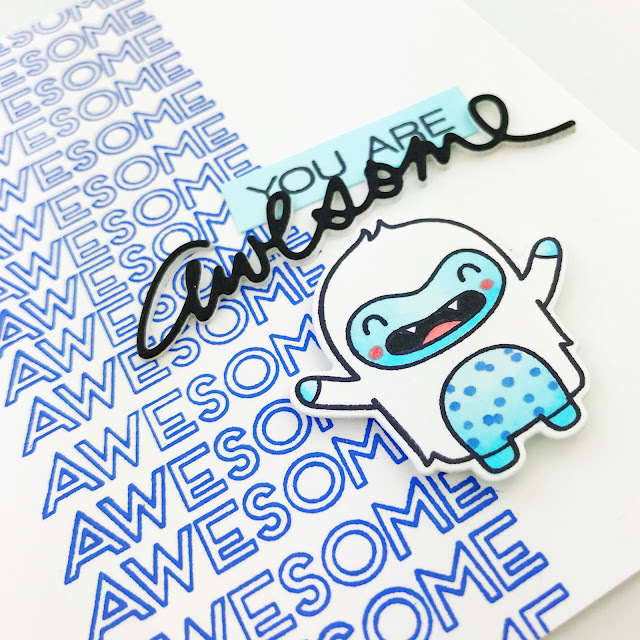 I love the repeat stamping of the sentiment in blue and the yeti is so sweet. Too cute! I love that you added some speckles/polkas to his belly! Great card! Great Blog Hop! Great initiative! This is darling!!!! I love the repeated word and your yetti is a hoot! As an autism mom of 21 years, I appreciate you so much for participating in this hop!!! Carly it is to no surprise that is is a adorable! All things you make are darling! I love this little guy! He is just amazing! How stinkin' adorable is this!?!?! I love it! And I love when crafters come together for a cause!!! Thank you so much for being a part of this blog hop. Its so great that so many individuals in the crafting community is willing to support awareness. The card is perfect, uplifting and oh so cute! Such a great card to spread a wonderful message of Autism Awareness. Your card is adorable. I love your coloring and design. Thanks for the inspiration! This is a perfect card for anyone or any occasion! I *love* your card! adorable. Thank you for supporting autism awareness. Fab design for a worthy cause. What a totally fun and awesome card! That Yeti makes me smile. Thanks so much for supporting this important cause! So cute!! I love that yeti!! I love the youthful feel of your card. SQUEAL!! I LOVE LOVE LOVE this AWESOME Card!! THANKS for supporting such an AMAZING Hop!! Have a FABULOUS WEEKEND! !